OKEMOS - It was a clear mild night, the perfect weather for a High School Football opening game Thursday, August 24. The crowd on both sides of the field was filing in as the Okemos Chieftains and the Mason Bulldogs warmed up for their 2017 season debut. The Okemos marching band played a rendition of Journey's "Don't Stop Believing" to set the tone for the night's game. The first quarter began with the Bulldogs receiving the kick from the Chieftains, putting them on the offense first. But Okemos' Defense held them back not allowing any points at all. Okemos senior captain Drew McGaughy ran the ball in for 2 touchdowns in the first quarter of the game, putting the team up 13-0. "Drew is a heck of player, he's on a mission," Okemos Head Coach Jack Wallace said. "I'm so excited to be his coach!" Going into the second quarter, Mason looked to get those points back, but a strong showing by Okemos once again kept them to not scoring a single point. The Chieftains Drew McGaughy interception helped the team as they finished the second quarter going into halftime at 33-0. 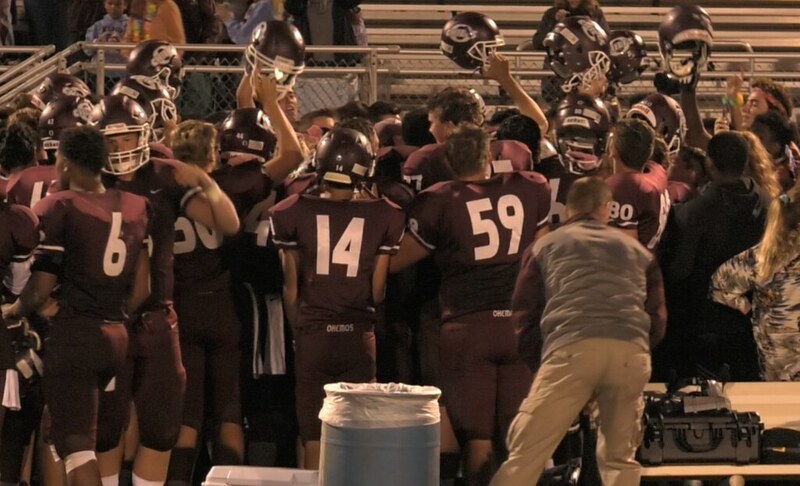 The third quarter saw a very pumped up Okemos return to the field hoping to continue their scoring success. The student section chanting "I believe that we will win!" Their running game once again putting more points on the scoreboard leading Mason 40-0 after 3 quarters of play. The last quarter of play it looked like Mason was looking to finally make gains on the offense and get on the board, but a fumble led to an Okemos recovery by Boni Domoulouka for a 76 yard return putting 6 more points on the board. The final score of the game was Okemos 46 Mason 0. A perfect way to open the season. "I'm so fired up, I won't be able to sleep tonight at all, it's just a special team, they're just a great group, it's alright, it's worth it!" Wallace said.